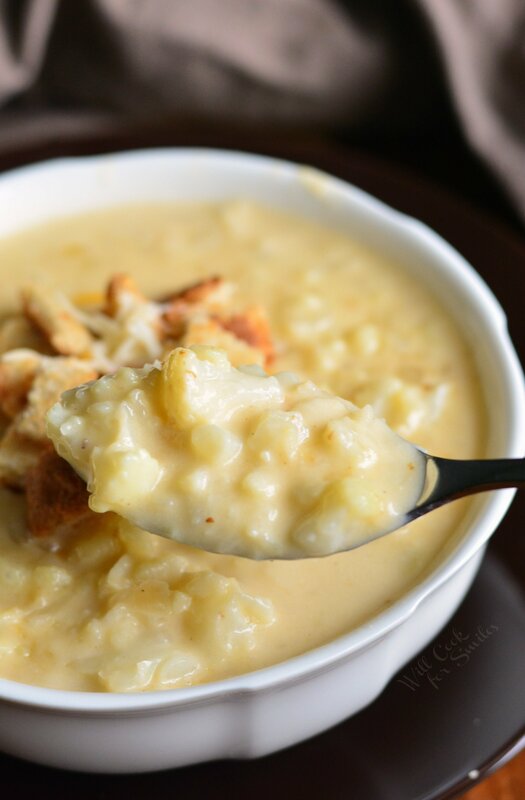 Comforting, cheesy cauliflower soup that’s easy to make for a weeknight dinner or a quick lunch. This simple cauliflower cheese soup takes only about 40 minutes to make and you will be enjoying this cheesy, creamy, hearty soup. This has been one RAINY season in Florida. Rainy summer is continuing all the way though August. I really hope that fall won’t be this wet because I have a lot of fun fall-themed outings planned this year. One thing that makes these yucky afternoons better is comfort food. 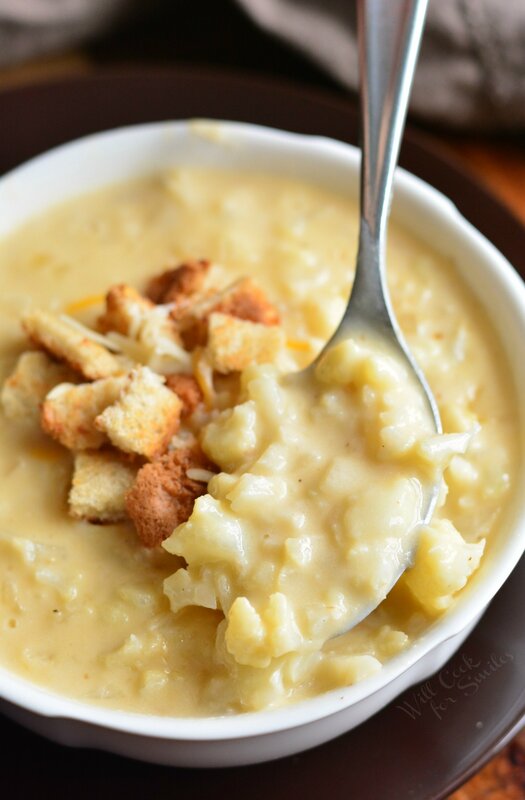 Rainy weather calls for soup, casseroles, and mashed potatoes. I love mashed potatoes, it’s pretty much the ultimate comfort food for me. Mashed potatoes and hearty soups are the best. I can’t wait for the cold weather to kick in so I can make all comfort food all the time. I’m already in the fall mood. It might still be August but in my mind, I’m already decorating the house with fall leaves and pumpkins. I’m waiting for the first day of September to hang my door wreath and decorate the outside of the house. If I do it now, my neighbors might think I’m crazy. Even though I’m waiting to decorate, I am not waiting to cook and bake our fall favorite dishes. This week, I surprised hubby with his favorite Pumpkin Cheesecake Pie after work and little man and I enjoyed THREE different soups. 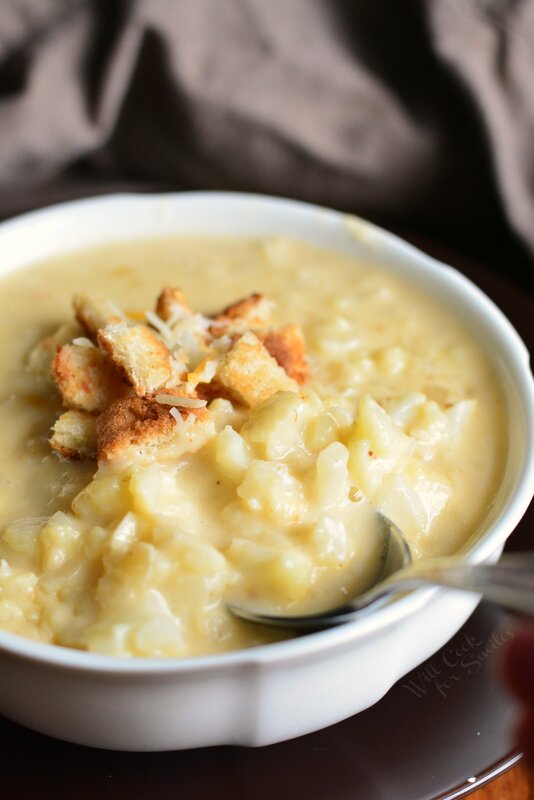 This Cauliflower Cheese Soup is my absolute favorite. I love cauliflower so much more than broccoli so a cauliflower cheese soup is the best, in my opinions. If you love cauliflower, you will agree! 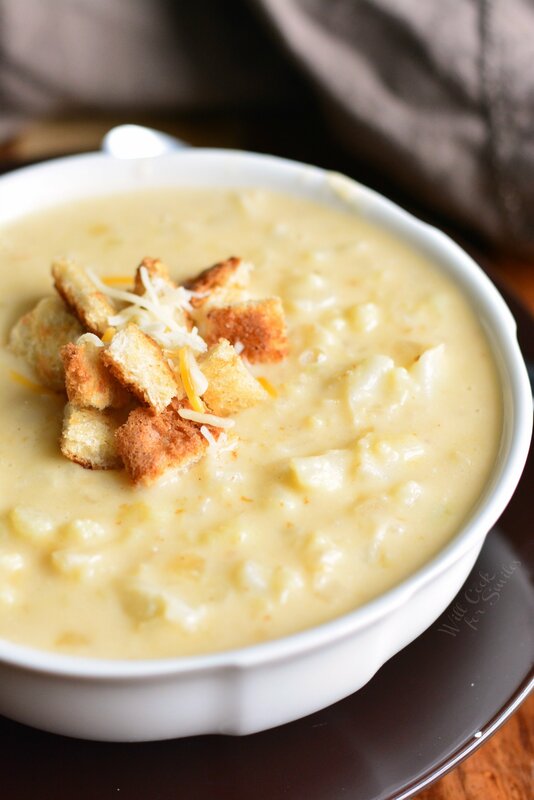 You can easily customize this cauliflower cheese soup to add meat of other flavors. I’ve added roasted garlic to this soup before and it was an amazing flavor addition. You can read about roasting garlic in this delicious Fettuccine Recipe. You can also add chicken or turkey to this soup. To add meat, you can add already cooked chicken while sauteing the cauliflower. You can also chop raw chicken or turkey into small cubes and cook it in the pot before cooking the veggies. Take the chicken out of the pot and use the same pot to start making the soup. Add cooked chicken back into the pot after sauteing the cauliflower. There are a few ways to make this soup lighter. First, you can try adding fat free half and half instead of heavy whipping cream. It’s not as thick as heavy cream but it will add smooth creaminess to the soup. You can also try fat free evaporated milk instead of heavy whipping cream. You can use lighter, 2% cheese instead of the whole milk cheese. CAN THIS SOUP BE GLUTEN FREE? Yes! This soup can absolutely be gluten free with one simple substitution. Instead of flour, you can use corn starch or gluten-free flour. Personally, I prefer to use corn starch. It thickens the soup nicely with just a small amount and the result is nice and smooth. 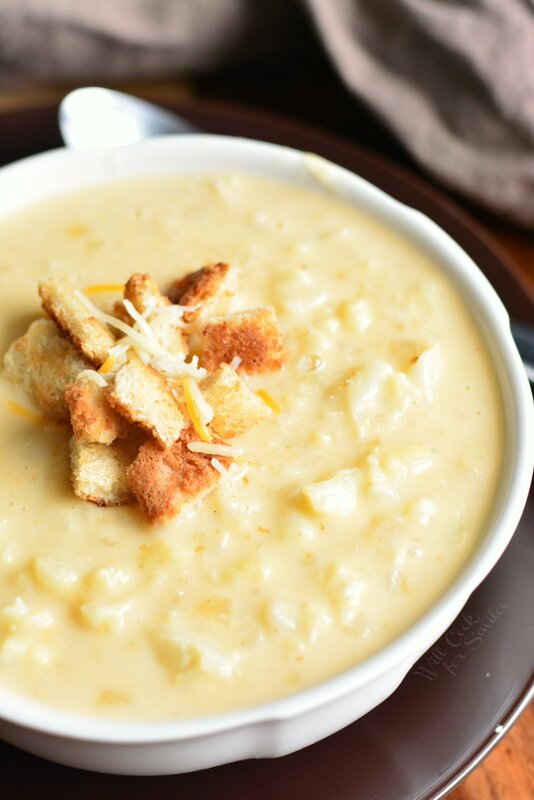 Creamy and Chunky Turkey Potato Soup – Delicious, comforting turkey potato soup that’s loaded with turkey and veggies. This creamy soup is made with accents of garlic and Parmesan cheese. The Best Mushroom Soup – This creamy soup is made with three types of mushrooms and fresh sage. It’s simple, hearty and guaranteed to please every mushroom lover. Prepare your veggies first. Dice onion and set aside. Cut cauliflower florets off and discard the bottom part of the stem ( you can use most of the stems in soup). Dice cauliflower onto small pieces. Set it aside as well. 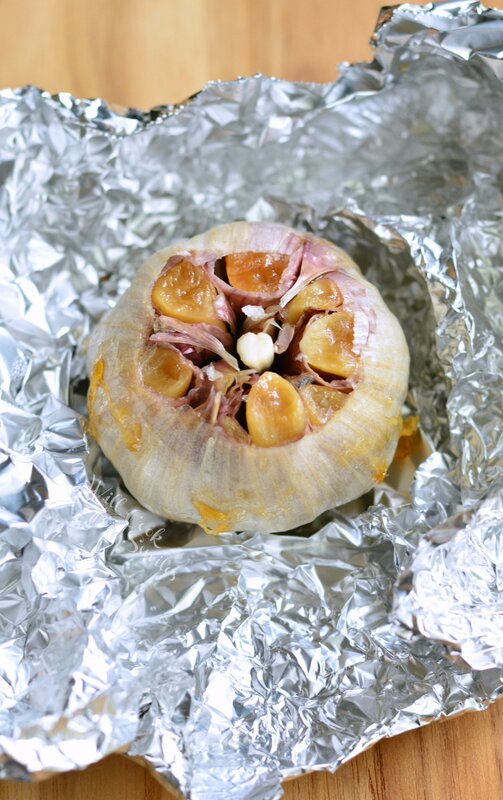 Peel garlic to be ready to press. Grate cheese on a large cheese grater and set aside. Add pressed garlic, mix, and cook until fragrant. Sprinkle flour over veggies and mix well. Start pouring in chicken stock, while slowly stirring. Add enough chicken stock to cover the cauliflower mixture. Add salt and pepper. Stir and cover with a lid, leaving a crack for steam to escape. Cook for about 20 minutes, stirring occasionally. Stir in heavy whipping cream and grated white cheddar cheese. Slowly stir until cheese is melted and smooth. Take off heat. OHMYGOSH Lyuba this looks AMAZING!!! Can’t wait to try a bowl! And I hope you will love it, Susan! What is the serving size for the nutrition facts? Is that for the whole batch? There are about 4 servings in the recipe. It’s about 1.5 cups of soup per servings. The nutritional fact is per servings so for about 1.5 cups. I made it using roasted cauliflower with some balsamic and roasted garlic….TO. DIE. FOR. Oh so much more flavor! Awesome, thank you! What do you mean by “Pressed garlic?” Do you mean press it down on a board & place them in the pot? Or could you just grate the garlic & place in the pot? Sorry for the silly question….never have seen that phrase before!! By “pressed” I mean press it with a garlic press. This looks amazing! If using cornflower instead of flour, do you still follow the same directions as flour? Thanks! I’ve never used corn flour before. To make it gluten free, I use corn starch. You would do it a little differently with corn starch. Skip the flour step and instead mix about 1.5-2 tbsp of corn starch with a couple of tablespoons of COLD stock in a little bowl. Set that aside. Follow pouring in the stock step and cook. After cooking for about 15 minutes, stir in your corn starch mixture. Stir it slowly and keep cooking for a few more minutes. You will see soup thicken. Stir as needed. I made this tonight and it needed some added seasoning for our taste. I added some thyme and seasoning salt, with some refd pepper. Without it, it was a bit bland. Thank you for letting me know, Lyn! Hi Deb! I haven’t actually tried making it in a crock pot but it won’t save you any steps. It will actually take longer, this is a quick soup. What is the reason you want to try it in a crock pot? Can you use vegan cheese for this soup? I’m sorry I didn’t get back to you sooner! From my experience with vegan cheese is it doesn’t melt well. Taste might be quite different but I’m sure you’re already use to the taste of vegan cheese. Try to find one that you know will melt better and you can definitely use it. I fixed this over the weekend. Hubby and I just love it. It was excellent and just perfect for a cold winter weekend.